With a wide variety of inexpensive tiles available there is no problem in finding something suitable for any bathroom or kitchen. Mass production means good quality tiles are low in price yet long lasting and very stylish. Tiles are sometimes the defining aspect of the décor, as in most bathrooms. At other times they are the trim to the other aspects of the décor, though as trim they may still be an essential element of the room’s look. The type of time we use for bathroom is often different to the type of tile we use for kitchens. The type of tiles used for floor is often different to the tiles used for walls. The classic choice for bathroom floors is porcelain tiles. These consist of high temperature fired clay, which are durable enough to be continually walked on. They are also suitably waterproof. 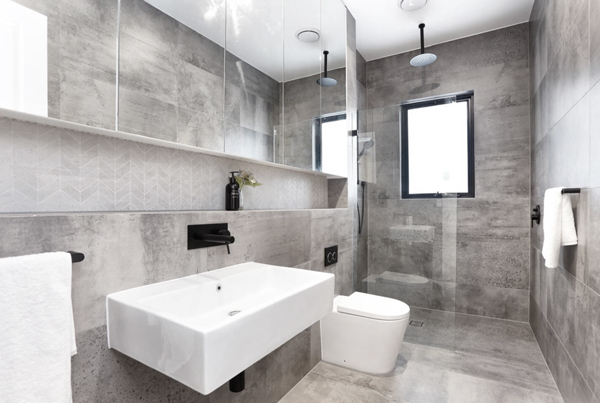 Natural stone is another popular option for bathroom floors. These can also be polished to a high shine. Sealing is required any type of natural stone. Some bathroom floors use mosaic tiles, which are small. These can be very time consuming to lay, but these tiles can also be bought in connected sheets that are laid with all the tiles correctly in place. It is also possible to make mosaics by combining small and large tiles.